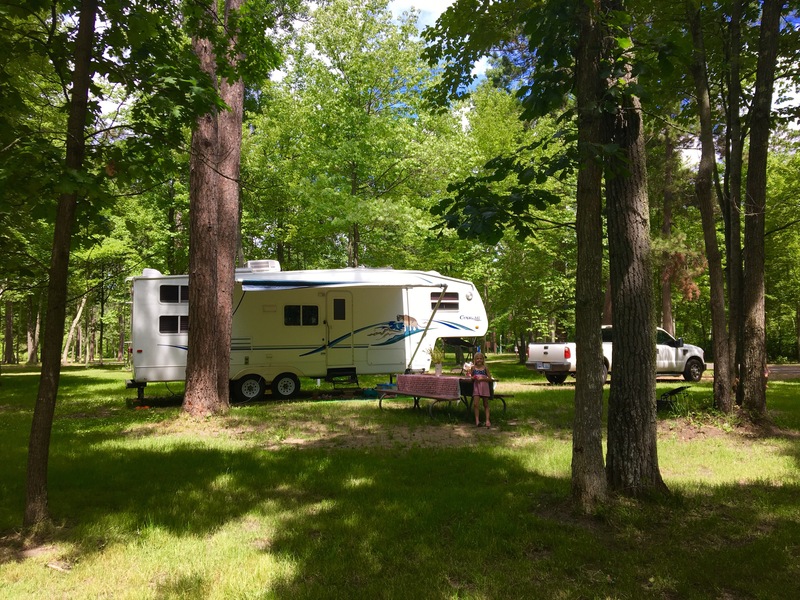 We found a COE campground near Lake Winnibigoshish with no amenities and only electric hookups, but it was inexpensive and nestled in the forest, so it seemed perfect. As we drove through the green, wooded campground dappled with sunlight, we had our pick of the mostly empty campsites. The only downside seemed to be that there were mosquitos and some very aggressive black flies determined to fly in the camper door no matter how hard we tried to make our entrances and exits quick. Although this lake isn’t technically the headwaters for the Mississippi River, the whole area is referred to as the headwaters area because the small river snakes its way between a number of large and small lakes in this region. 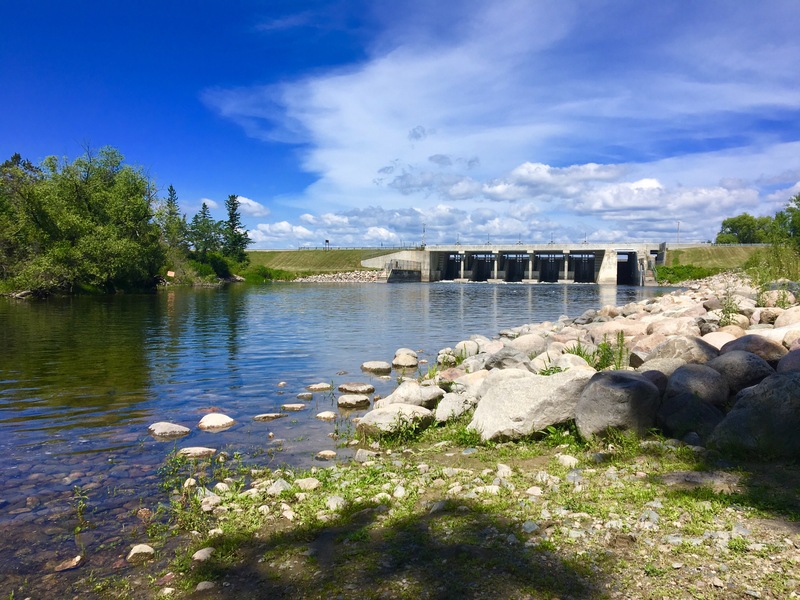 A series of dams were constructed on these lakes in the 1800s to help stabilize the water level of the mighty Mississippi throughout the seasons of the year. Our campground was next to the first one constructed; Winnie Dam. Winnie Dam letting a small Mississippi River emerge from Lake Winnibigoshish. On the day we arrived the neighboring town of Deer River was having a downtown festival, so the girls and I went into town to check it out. Deer River is proud of this annual event; a fundraiser for the local Lions Club, and they tout it as the largest Wild Rice Festival in the World. We arrived just in time for Sunny to sign up for the 7 year old division of the Kiddie Tractor Pull. She took the silver. 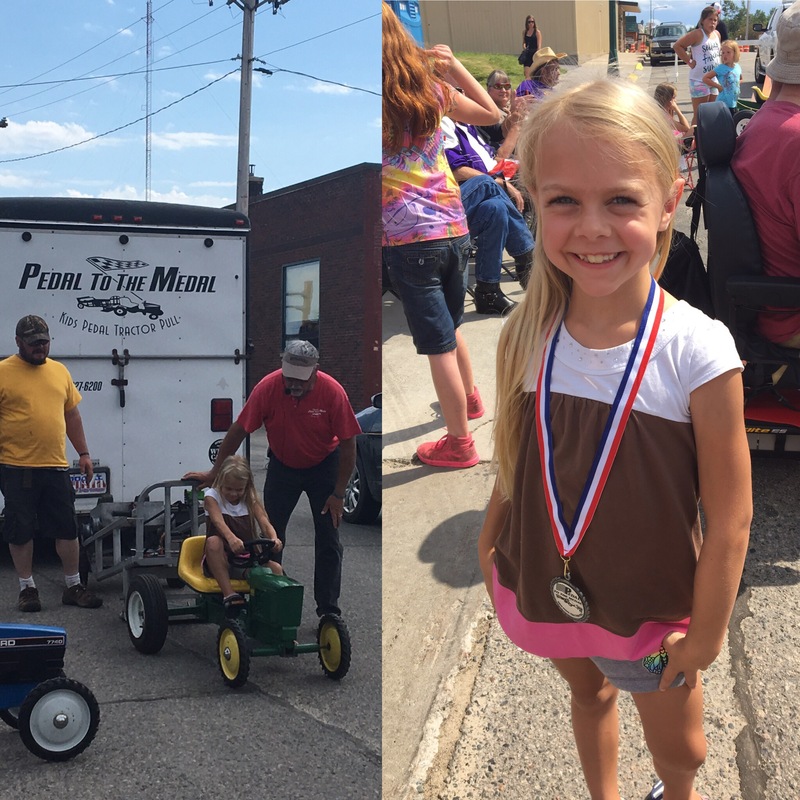 Sunny taking 2nd place in the Kiddie Tractor Pull. There was also a parade, live music, a carnival, and concession stands where I was able to get some fried cheese curds (a northern treat that I’d wanted to try before we left this area) from a traveling circus man. “We don’t have these where I’m from, so I’m eager to try them,” I said after I ordered. “Don’t have them where I’m from in Tampa either,” he replied as he scooped curds into a paper bowl. When I told him we lived in Washington he said, “You guys got apples up there!” I wondered to myself if this is the same crew of people that bring the carnival to Wenatchee every April. This stole a bit of the magic of eating this local delicacy in Minnesota, but the greasy, crunchy cheesy bites were still delicious. Plus I wasn’t hungry for about 24 hours afterward – bonus! There was also a “flea market” that was a mix of artisans wares, local businesses having side walk sales, and family yard sales. One booth was filled with hundreds of DVDs for $1, clearly a truckload of movies purchased from several video rental stores that have gone out of business. The girls and I each picked out a few since it was a better deal than Redbox. 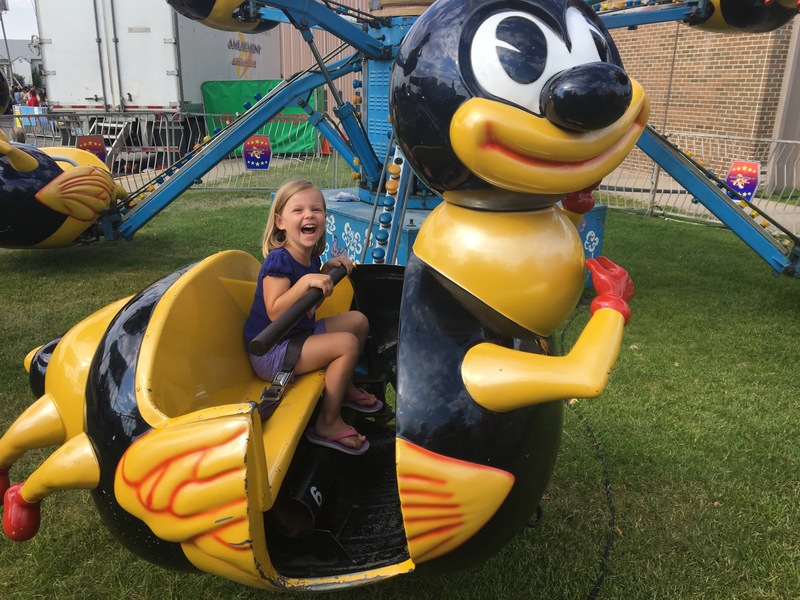 Coral delighted to be on the bee ride at the World’s Largest Wild Rice Festival. 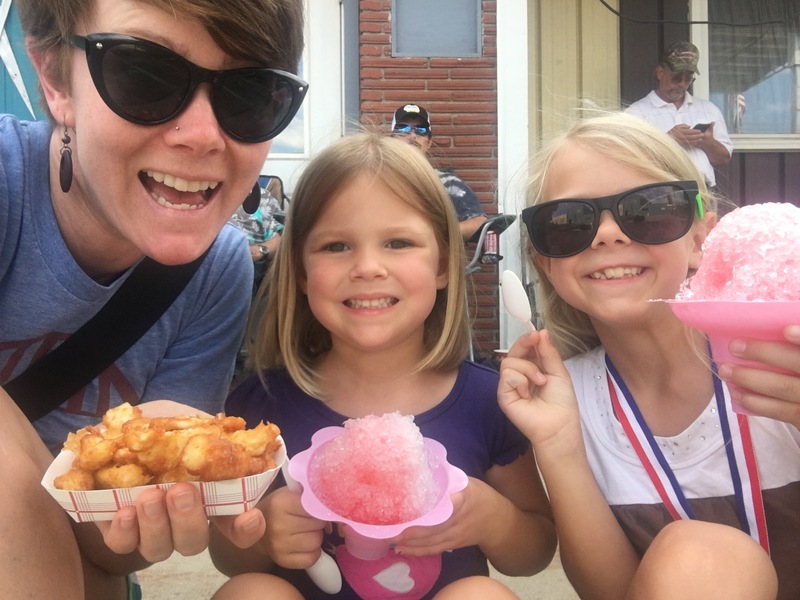 Enjoying some fried cheese curds and snow cones! That evening Brad was itching to get outside into some wide open natural spaces so he went out for a walk. He came back awhile later because he was literally itching to get inside instead. He said it was one of the most beautiful places he’d explored in awhile, but he couldn’t remember a more miserable hike. 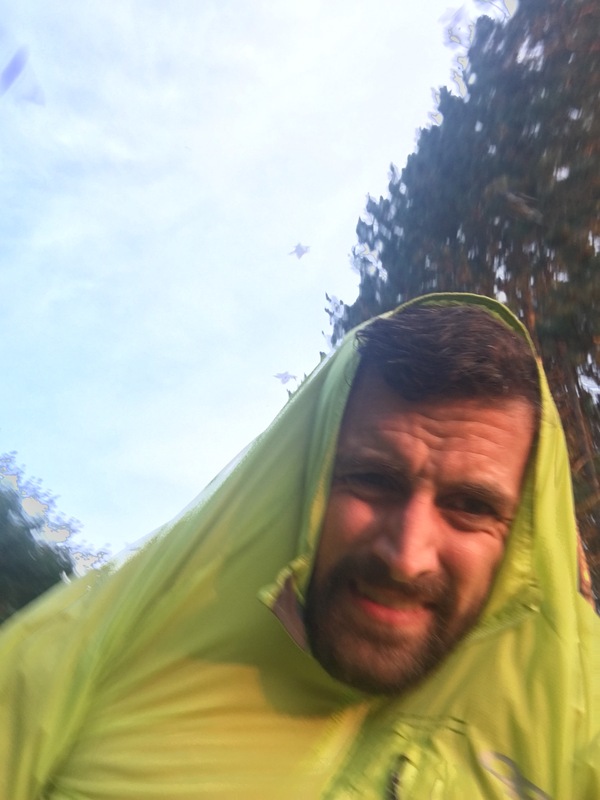 As he walked the lake front trail, he was bombarded with biting black flies, mosquitoes, ticks, and swarms of what were maybe midges. He wore long pants and sleeves to discourage the various blood suckers, but ended up with numerous bites on him even through 2 layers of fabric. “I never want to go outside again,” he said upon return for the first time in his life. He even tried our upstate NY trick of wearing a jacket around his head, but he said the bugs were getting trapped inside the cover with him. 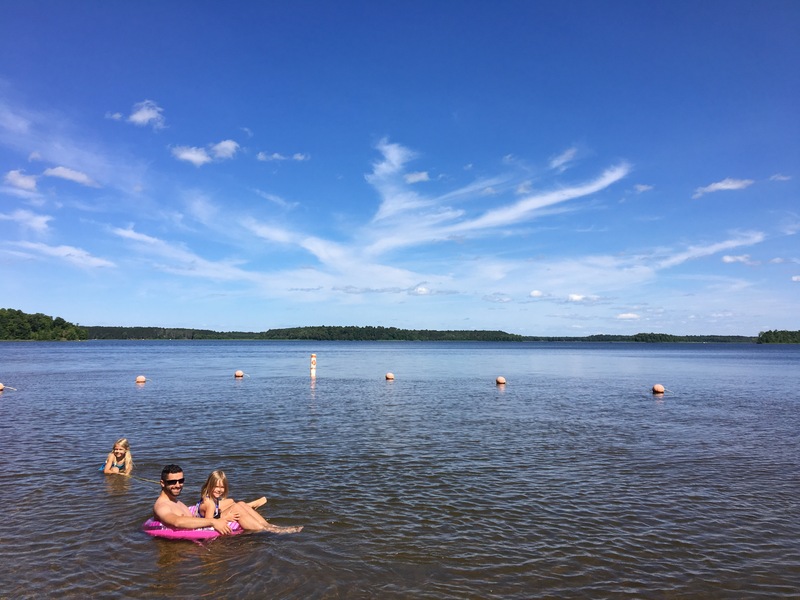 The next day, determined to have a more positive experience in this beautiful place, we braved the great outdoors again to check out a swimming area on Lake Winnibigoshish we heard was nice. We were prepared to leave quickly if the bugs were bad, but we covered ourselves in bug spray, and besides a few mosquitos and black flies it wasn’t bad at all. The fact that we had the entire place to ourselves made it worth a few bites. The water was shallow and warm, so it made a perfect place to relax and play with the girls. 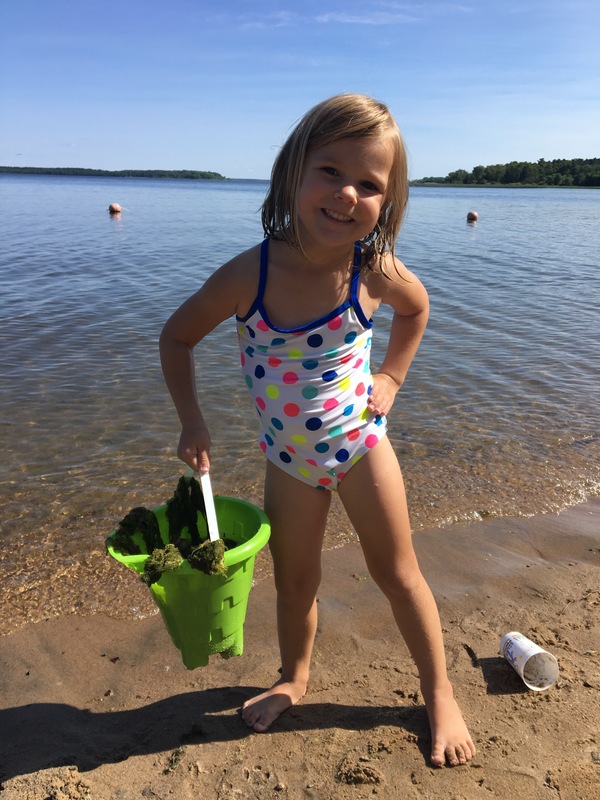 Coral collected numerous snail shells in her plastic bucket, and Sunny pulled people around on her inner tube “speed boat”. I sat on the shore reading and enjoy the private vista, feeling proud that we had possibility created a fun experience that would take the place of all the bugs in our memories of this place. I took photos of the water and the sky, of Coral with her bucket, of Brad playing with Sunny and I wondered why the native people had used the word “Winnibigoshish” to describe this place, which means “miserable wretched dirty water.” It must have been a very different lake when they named it, because this seemed idyllic. Coral the snail & moss collector. A lovely afternoon at Lake Winnibigoshish. But then Sunny got a leech on her ankle. Did you know that they attach to their host with both ends of their body? That’s a wrap on Minnesota….